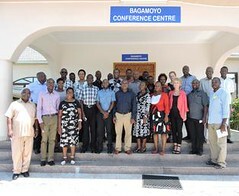 The International Livestock Research Institute (ILRI) is using innovation platforms (IPs) in various projects in Uganda to bring together actors along livestock value chains to find solutions to shared challenges. These IPs, which are also known as multi-stakeholder platforms (MSPs), are vehicles for collaborative research for development that help address development constraints prioritized by the stakeholders. Effective communication has emerged as one of the glues that holds together effective IPs. Through periodic meetings to phone interactions, the leaders of these IPs strive to keep the members informed and involved. But the platforms face particular challenges to agree meeting times suitable for all and who pays for the day to day services. 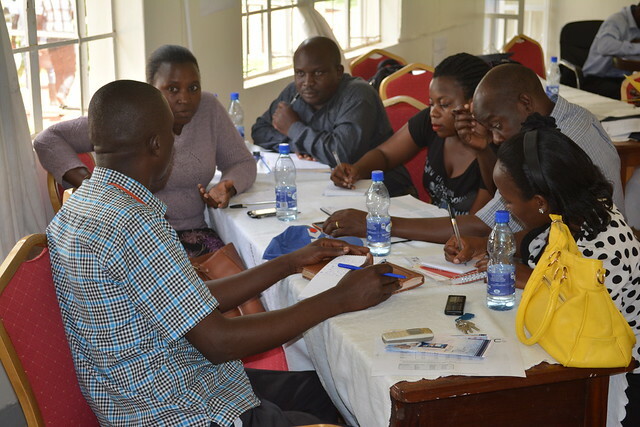 In Uganda, pig multi-stakeholder platforms in the the central region of the country (covering the districts of Mukono, Wakiso and Kampala) have embraced opportunities presented by smartphones to enhance communication and knowledge sharing. 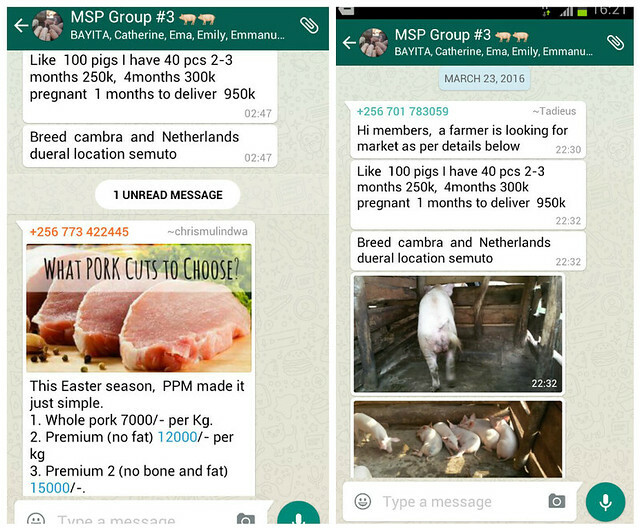 Using WhatsApp, a messenger application that uses the internet to share text, images, videos, documents and calls on smartphones, the MSP has created chat groups where pig farmers, traders and service interact virtually and in real-time. Using these forums, farmers can access information on markets, inputs and services and they relay information on pig husbandry, advisory services, disease outbreaks as well as markets for pigs and pork. Group session during a multi-stakeholder platform meeting in Mukono (photo credit: ILRI/Brian Kawuma). Christopher Mulindwa of Pig Production and Marketing (PPM) is an ardent user of social media and is a member of the central region MSP. 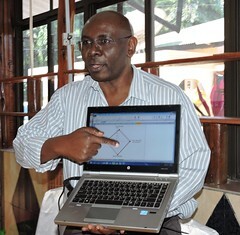 His company offers training and advisory services to pig farmers. For over a year now, he has used the WhatsApp group to advertise training courses, giving dates, venue and participation fee. ‘The groups chat helps me share information on my services with so many actors in the pig value chain at minimal cost,’ Mulindwa says, ‘and unlike using radio or print media, I get instant feedback from interested farmers’, he says. The smartphone chat groups are filling a void in communicating advisory and other information to stakeholders in the platform. The farmers in these groups also benefit from peer-to-peer learning by sharing knowledge and experiences and occasionally getting technical information from veterinarians who are members of the group. Tadieus Kyobe, a pig farmer from Wakiso, central Uganda uses the WhatsApp group as a source of information on pig production but also occasionally markets his pigs on the forum. ‘I get valuable information from other pig farmers in the group who have more experience than me and from vets. I have learned a lot in the last couple of months’ he says. In Uganda, the pig multi-stakeholder platforms have been running for two years and continue to attract the participation of pig producers, traders, input suppliers (of feeds, drugs and extension services) as well as policymakers (such as veterinary departments and regulators). In Masaka, Kamuli and Mukono districts, the stakeholders are embracing collective action by forming pig actor associations or producer cooperatives (particularly in Masaka). In Lira District, the local government’s Veterinary Office is working with pig value chain actors to combat Africa swine fever (ASF) through sensitization radio talk shows. Furthermore, the national pig MSP has engaged policymakers to revise the livestock feed policy to include regulations on pig feeds. Social media provides an alternative to reaching pig farmers in far-flung locations of Uganda, within a short time and at minimal cost. But wider use and success of this innovation is constrained by the relatively low level of mobile phone penetration among the smallholder pig producers and inadequate and often expensive access to the internet. Tags: ict4ag, Innovation platforms, social media, whatsapp. Bookmark the permalink. Thank you Jean. Your contact (+256772402293) has been shared with the Whatsapp group administrator for inclusion. Hullo Francis, thansk for the enquiry. A gentleman called Emmanuel Kabaale will contact you about this. I am Geoffrey Gidaga phone 0776566213 and e-mail ggidaga@yahoo.com a pig farmer in Nwoya district would like to join the whatsapp group. Thanks for this great innovation, learning platform! My name is Bosco and am a pig farmer.Kindly add me on your watsap group. My watsap number.. Thank you for taking interest in this Louis. You will be added to the whatsapp pig platform in a few minutes. Wow, this is a great platform. please add me to the WhatsApp group too. my number is 0700246389 . I have started a small piggery project here in lira n would like to get information on how to improve the breeds. OKODI WILLIAM. Hullo Brian, thanks for expressing your interest. Your number will be added to the platform shortly. My name is Oswald l am a pig farming Equipment and Vaccination supplier..
Can you kindly add me in your group,my Whatsapp number is +264816441963.